Let’s work together to help those affected by workplace fatalities, life-altering injuries and occupational disease. Let’s work together to prevent future tragedies. Threads of Life partners and sponsors spread the word to ensure more people have access to support. 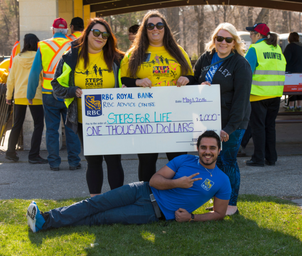 They help make events happen through corporate and individual volunteerism. And they provide funds for our programs and services. 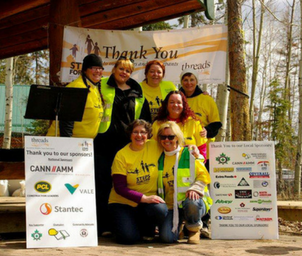 Our partners and sponsors make Threads of Life possible! Our goal is to ensure that everyone who could benefit from Threads of Life’s programs will be aware of what we have to offer. To achieve that kind of awareness requires the help of many organizations and individuals. Your company can help us spread the word through channels like your newsletters, web sites, trade shows and more. As a small organization we rely on our tremendous volunteers to help fill various volunteer roles. 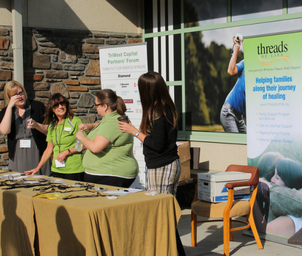 Many companies help by encouraging and enabling their employees to volunteer for Threads of Life. 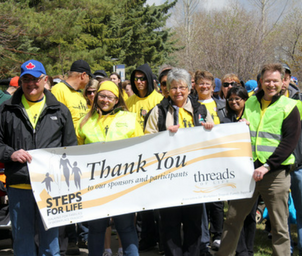 Help Threads of Life to get more people involved in our annual Steps for Life fundraisers, or use your networks to promote our speaker’s bureau. There are plenty of ways to help our participation blossom! As a national charity Threads of Life relies on individuals and corporate partners to meet our annual funding targets. Help by becoming a corporate partner, sponsoring an event or program, or holding a fundraiser. Make a donation or name Threads of Life your Charity of Choice.